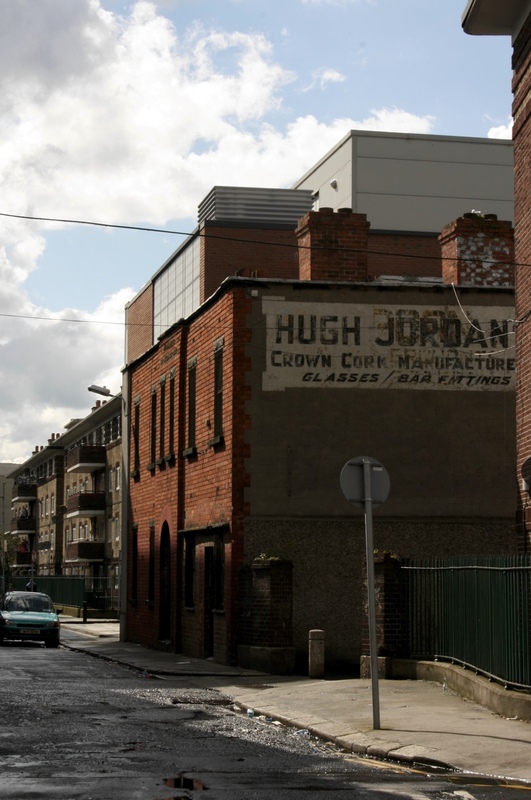 Mark’s Lane runs parallel to Pearse and Townsend Streets, separating the Markievicz flat complex from St. Mark’s Church. 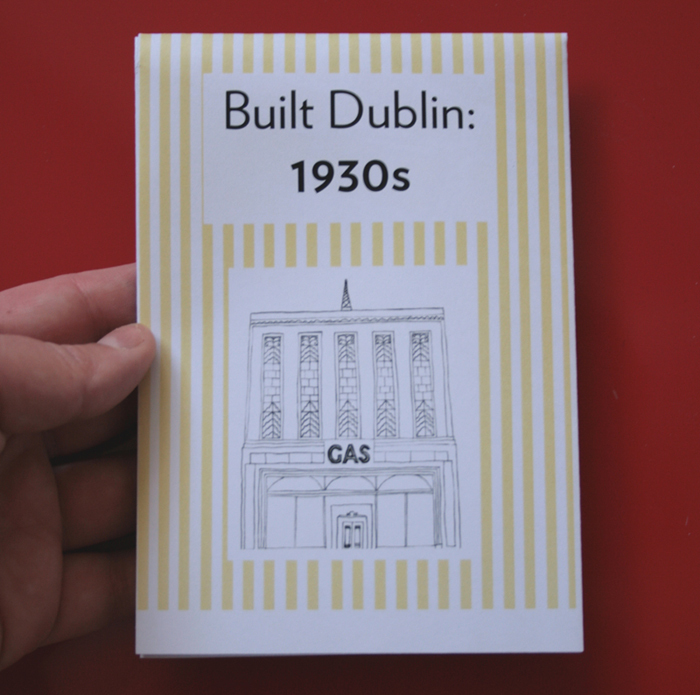 The Markievicz block (Dublin Corporation/Herbert Simms, 1934-6) presents a symmetrical, nicely composed facade to the street, with the entrance portal at the centre, and that’s a good enough reason to take a walk down the lane. From the Lombard Street end, you can see a painted sign on the rendered side of a brick building, just behind the Lombard Simms block. 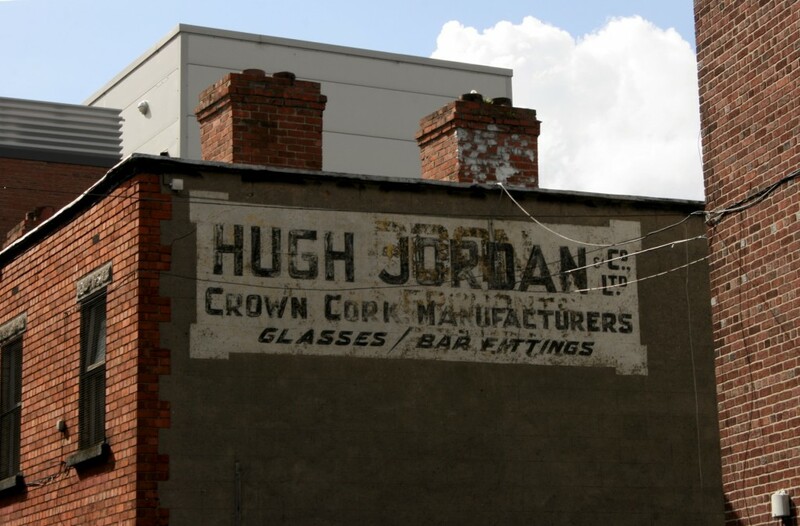 It’s advertising “Hugh Jordan & Co. Ltd. – Crown Cork Manufacturers – Glasses/Bar Fittings,” though if you look closely, it’s a two-for-one, with an older Hugh Jordan sign underneath. For a fan of painted signage, this does it right: painted directly on the building, every letter stark and perfect (albeit faded), and with an interesting compositional touch in the corner motif. It’s a plaque, it’s an ad, and now it’s a ghost sign. The company moved to Airways Industrial Estate in Swords in October 2006, and are still operating as catering suppliers covering just about everything from fit-outs to cutlery.